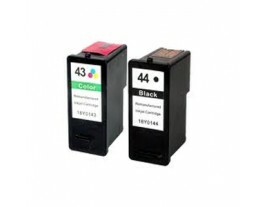 Compatible Lexmark 43XL 44XL Ink Cartridges are available for a discount online. Save even more money by buying several Lexmark 43 Colour/44 Black Ink printer cartridges at once. All printer/inkjet mulitpack supplies come with free postage in the UK, with next day delivery the norm. Quick delivery means these printer ink cartridges, suitable for Lexmark printers/inkjets, will be refilling your printer in no time with minimal hassle. Buying genuine Lexmark compatible 43 Colour/44 Black Ink cartridges, online can save you money while ensuring printing results remain consistent. Lexmark 43XL/44XL Ink cartridges have 21ml of black and 15ml of colour ink.